The shortbread layer: this couldn't be much easier. Instead of softened butter, this recipe uses melted butter so you can stir all the ingredients together in a bowl and then just turn the crumbs out into the pan. Use your hands and palms to press and spread the crumbs into one even layer. Then dock it with a fork. Bake for 25-30 minutes until lightly golden. When it's out of the oven and warm, it's recommended you take a large flat spatula to press down on the shortbread to compress it to make it easier to cut later. I did this but I have to say I still had quite a bit of breakage and crumbing when it came time to slice. Let the shortbread cool for about 20 minutes. The caramel layer: It's all about the texture. You want a soft, chewy caramel that stretches if you snap the bar in two and pull it apart. 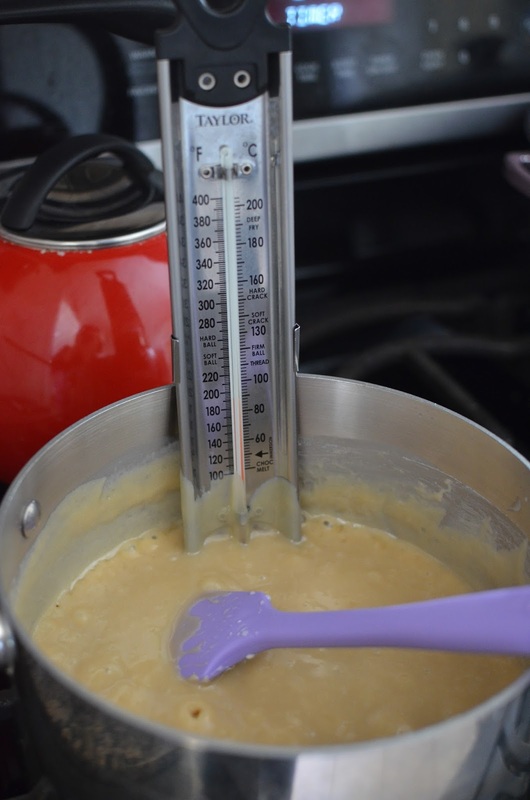 For that, a candy thermometer is a necessity. The ingredients are sweetened condensed milk, brown sugar, heavy cream, corn syrup, butter, and salt. Cook it over medium heat, stirring frequently, until it reaches a temperature between 236 and 239 degrees. This is essential and takes 16-20 minutes. Once ready, pour it on top of the shortbread crust. Throughout the whole process of making the caramel, the mixture is obviously extremely hot so be careful! Once the caramel layer has been spread, let it cool completely for about 1 1/2 hours. Now...for the chocolate layer, my favorite part! Cook's Illustrated (and I) highly recommend Ghirardelli's 60% bittersweet chocolate bar for this. You need 8 ounces in total. Chop up 6 ounces and finely grate the remaining 2 ounces (using the small holes in a box grater). It's a little messy and time consuming to grate the chocolate but I found that following the instructions precisely resulted in a perfectly set chocolate topping that did not bloom after it cooled and had a nice hard texture to it. In essence, it's been tempered. And in order to essentially temper the chocolate (melt it slowly) in the microwave, you start by putting the 6 ounces of chopped chocolate into a bowl and heating it on 50% power, 15 seconds at a time, stirring after each time. Repeat until chocolate it just melted and it isn't much warmer than body temperature (test by feeling the bowl with your hands). This will take 1-2 minutes. Then, add the 2 ounces of grated chocolate and stir well to combine. If necessary, return the chocolate back into the microwave no more than 5 seconds at a time (again, at 50% power) until all the chocolate is just melted. Spread the chocolate evenly over the top of the caramel layer. Place the pan in the refrigerator for about 10 minutes to set. That's all it takes. To slice the millionaire's shortbread into bars, lift it out of the pan using the foil overhang, and remove the foil. Use a serrated knife and slice it into half crosswise, then half again so you have 4 equal rectangles. Using a back and forth gentle sawing moment is recommended. Then, slice each into 10 bars for a total of 40 bars. Each one will be very satisfying! Hopefully, yours will be less messy than mine. However messy mine were, they made up for it in taste. The chocolate is hard and cracks underneath your teeth while the caramel is nice and stretchy, smooth, and soft. The shortbread reminds you why you love the simplicity of a shortbread cookie. After you stow some away for you and your family to enjoy (my husband made it a point to remind me to keep some), pack some up for friends! It's the holidays and a great time to show you care with something sweet and homemade. Combine flour, sugar and salt into a medium bowl. Add melted butter and stir with a rubber spatula until flour is evenly moistened. Crumble dough evenly over the bottom of the prepared pan. Use your fingertips and palm to press and smooth the dough into an even layer. Using a fork, pierce the dough at 1-inch intervals. Bake until light golden brown, 25-30 minutes. Transfer pan to a wire rack. Take a sturdy metal spatula and use it to press on the entire surface of the crust to compact it (this is to help make the finished bars easier to cut). Let crust cool until just warm, at least 20 minutes. For filling: Place all ingredients into a heavy-bottomed saucepan and stir together. Cook, over medium-heat, stirring frequently, until temperature reaches between 236 to 239 degrees (it will fluctuate), 16 to 20 minutes. Carefully pour the mixture (it is very hot) over the crust and spread evenly using an offset spatula. Let cool completely, about 1 1/2 hours. For chocolate: Place chopped chocolate into a bowl and microwave it on 50% power for 15 seconds at a time, stirring after each interval. Continue until chocolate is just melted and not much warmer than body temperature (check by holding bowl in the palm of your hands), about 1-2 minutes in total. Add the grated chocolate and stir together until smooth. If necessary, return chocolate to the microwave for no longer than 5 seconds at a time (again, on 50% power) to finish melting. Spread over the caramel layer and smooth it evenly using an offset spatula. Refrigerate the pan until chocolate is just set, about 10 minutes. Finish/slice the bars: Lift shortbread out of the pan using the foil overhang and remove the foil. Place onto a cutting board. Using a serrated knife with a gentle sawing motion, slice bar in half crosswise so you have two 6 1/2 by 9 inch rectangles. Then slice each of these rectangles in half again crosswise so you have 4 strips. Slice each strip crosswise into 10 equal pieces, for a total of 40 bars. Store at room temperature, between layers of wax or parchment paper, for up to a week. Can't wait to see your new kitchen!! 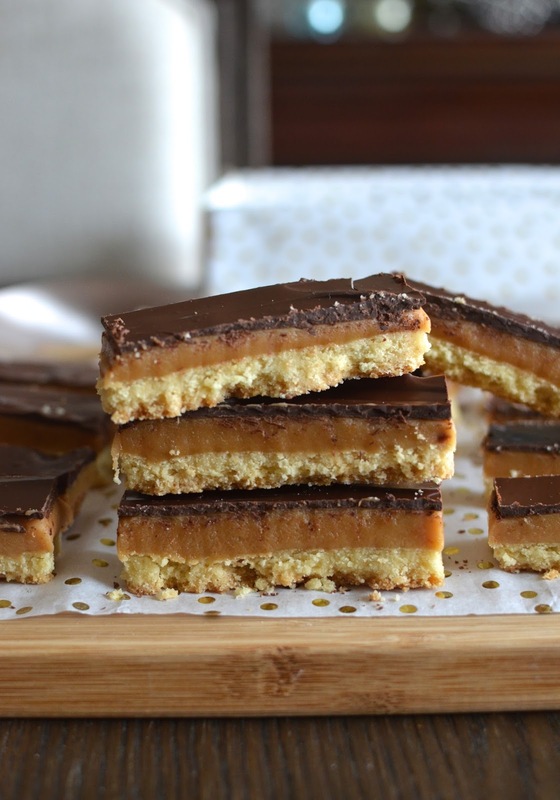 These shortbread bars with chocolate and caramel look irresistible! It won't be very dramatic. : ) Just taking out the old and replacing with new. Same space but definitely looking forward to cooking in it again. Oh my yum! these shortbread treats look and sound amazing! Yummmmmmmm! And I love that soon you are going to get an updated kitchen. Time to celebrate! It's so funny that you comment on the bars not cutting neatly, because the first thing I thought (right after yum) was how pretty and neat the bars look! I was even going to ask you how you do that! :) Making soft, chewy caramel is on my "learn to do" list", and now I know where to go for the recipe! As you know, tempering chocolate is a nemesis of mine. Bravo,Monica, that you were able to temper to a shine and a snap! Good luck on the kitchen renovation. You are amazingly calm about it! You are very sweet and generous. I loved how that caramel turned out...nice and soft & chewy. The thermometer will make it right. And I'm with you on tempering. I don't even try to but this effectively did it and I was amazed...no blooming. Love Twix bars!!!! making these for a Christmas eve party we are going to. Thanks Monica! Also can't wait to see your new kitchen, I bet you are excited. Thanks for the kitchen wishes...always nice to change things up and have a fresh space. Fingers crossed! I think you did a great job cutting these! And they're so cute, cut into the Twix bar shape. Having been through a kitchen reno myself a few years ago, they're hard to live through but so nice to have done! Good luck! Thank you, Beth. Appreciate the kind words. I could use a few Twix right now! Thanks, Kelly. I love millionaire's shortbread, it's just the best! I've actually never had these either if you can believe it. They look so yummy! Definitely a good project to make for gifting, enjoying during holidays. Thank you. And this shortbread! What I would do for one right now with my tea! Eeek is right, Ashley. Every "small" project has complications as you no doubt will confirm. Thanks for the good vibes. Love that! I've looked at this recipe so many times and just knew I would love it! Thanks for making it for me - I guess my box is in the mail? haha! Best wishes on your kitchen renovation. We've never finished ours 100% and still have half - a half bath to finish. Sheesh :) Oh well - I bet it will be amazing! Merry Christmas to you! I hear you. I'm really glad I finally took the plunge to try these. Super addicting. Thank you, Tricia. If I added these to my holiday baking trays they wouldguaranteed it be the first things gone! So agree...these bars are decadent and delicious. It's been a long time since I want to renovate my kitchen, but just didn't get enough motivation. All the best for your renovation, you would be working in your beautiful new kitchen in no time. 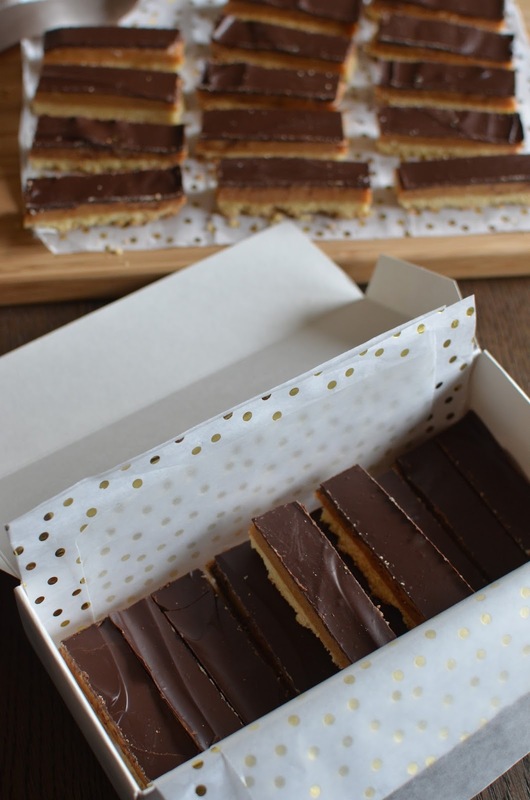 :) Love Twix bars and these millionaires shortbread would make a lovely treat for any day. We're not doing anything major but still, it is a project. It took me many years to get to this 'motivation' point so I hear you. I've heard of the millionaire's shortbread but haven't ever tried it…that must change. OMG look at that decadence. I don't think these would last very long in our house for sure. RENO of kitchen is painful. Hope it goes quickly and it looks like a million bucks when you are done. I've heard of this millionaire's shortbread but never had any, it looks really good. Great thing about renovating the kitche, we did it 2 years ago and I love it. I love Twix bars too! I might even have a slight obsession with the little mini Twix bars ;) These look fantastic. Thank you, Bianca. Hope you're having a great holiday season and enjoying your engagement. Congrats!! Oh my gosh, I just tasted these as a friend of mine made them! I immediately asked for the recipe. AMAZING!! I'm wondering how these would turn out if I used candy melts on the top. I know the flavor wouldn't be quite as rich and decadent, but I'm looking for something fun and yummy for my daughter's graduation party. I thought about making these and using her college colors to swirl or create that design where you make stripes and then drag a tooth pick through horizontally...any thoughts on this? Anyone tried it with candy melts? They do taste pretty awesome, yes. : ) Your idea sounds really fun and I see where you're going with it. I've never tried this with candy melts but I would think it should work (unless some reason why it wouldn't adhere to the caramel...but I wouldn't think so). Definitely be fun to mix colors and go for it since you'll be sacrificing the chocolate flavor and going for the visual. Good luck and happy graduation to your daughter! Thanks for sharing this recipe. I made them today and it turned out great! Wonderful to hear that. Thank you.